Holiday Travel Must-Haves | Breezy Mama Breezy Mama - Expert parenting advice, celebrity interviews, product reviews for kids, moms and babies and more! It’s already November 11 (wasn’t Halloween just yesterday??) which translates into only two more weeks until Thanksgiving. And after that? The Christmas/Hanukkah/Kwanzaa holidays. What am I getting at? I’m letting you know that the season of traveling is upon us. If you’re like me, you hate lugging all your big, every day toiletry essentials. I like to keep them compact, and the fact that I’m spending $4.00 on a tube of toothpaste that will only last the weekend is fine–hey, at least it fits! So, I was very excited to stumble upon the following products–all mini, all essential, and all under $10.00! These little numbers (10 mL to be exact) are fantastic if you won’t have access to a washer or dryer. They’re intended for hand washing (as in your hotel’s bathroom sink) and don’t require a rinse, so there’s no need to worry about getting all the soap out. Gentle enough to use on everything from underwear to baby’s bedding (because we know an accident in the pack n’ play is just our luck), Soak Wash is a definite must. We know that you’ll love it so much you’ll probably end up buying the 14 ounce bottle to use at home. 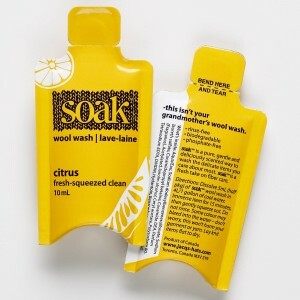 $1.25 each, click here to purchase from Soak. Ahhhh the tissue–a little piece of paper that we rely on heavily during these travel times. Instead of having a whole pack take up room in your bag, invest in these individually wrapped mini tissues. Just pop them out of the packaging (it’s like a mint in a wrapper), add a bit of water to it, and — voila! — you have yourself a tissue. How cool is that? $2.99 for eight, click here to purchase from miniTISSUE. As we all know, flying with your toiletries is a nothing but a pain these days. The liquids need to be separate from the rest of your products, and they have to be no more than three ounces. 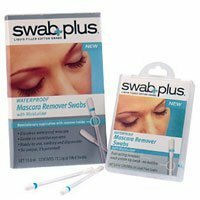 That’s why these little swabs are complete gems. The liquid is in the plastic tubing in between the two swabs. Just crack one side open, and the liquid fills the other swab. Pure genius. They have them available for all sorts of other uses–from cuticles to first aid to lip therapy. The ones pictured here are to take off your mascara. $4.95 for 24, click here to purchase from Amazon. Let’s not even think about the amount of germs that will be floating around the airports, hotel rooms, or even your aunt’s house with all the kiddos running around. Instead, just pack your paper soap sheets because you know that washing with soap is much more effective than using antibacterial gel. You don’t even need a sink, just have your child hold the sheet as you pour water on his hands from your bottle of water! 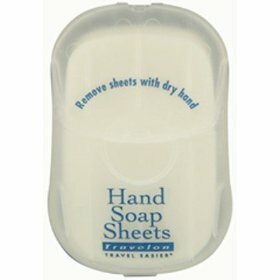 $5.39 for 50 sheets, click here to purchase from Amazon. 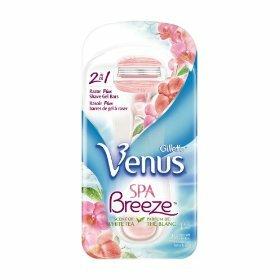 I’ve had my Venus Razor for eons, but just recently tried the Spa Breeze cartridge (which fits on the Venus handle) and fell in love. The cartridge has a little strip of soap on the top and bottom of the razor, so you don’t need to use soap or shaving gel. Saves you time–something we all could use a bit more of. And more importantly, it’s one less thing for you to pack. $8.37 for four cartridges, or $10.37 for a Venus razor and one cartridge, click on either to purchase from Amazon. Breezy Tip: Need some advice on traveling with children? Click here to read Breezy Mama‘s article on making traveling with kids a success. Good luck and have fun! Haha, I remember those Sab Plus packs from the good old magazine days! Glad you’re keeping the love alive.